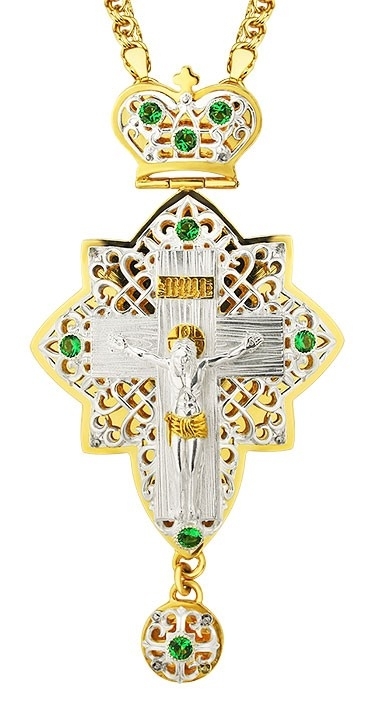 Pectoral cross - A119 (with chain) - Istok Church Supplies Corp. This pectoral clergy cross of a small size has eight-pointed form and is made of brass. The front wall of the cross is a three-dimensional molded "grid", covered with quality 24K Sterling silver-gilding. Around the Crucifixion are manually fixed phianite stones. The back wall of the cross is a mirror gloss polished plate, covered with gold-gilding, which was applied by galvanic method.